Amazon has 2 more JNC series listed with paperbacks. 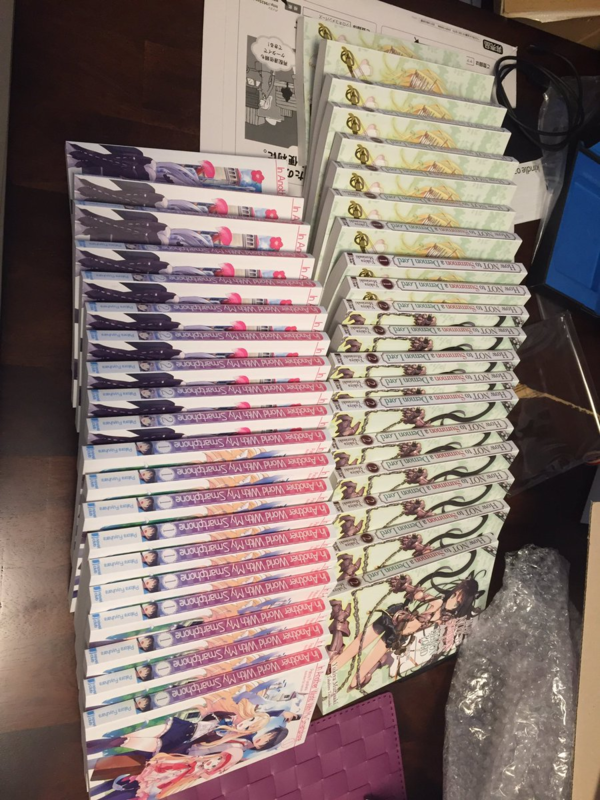 All jokes aside though, this means they would have 4 LNs listed with paperbacks, if I am not mistaken. Man that is nice, especially since I am not a big fan of ebooks and they have some series I am interested in getting. @happy I call them madlads even more that they are releasing both volumes 1&2 of Smartphone and Demon Lord on the first day lol. Saw some manga chapters of elf bride and they were enjoyable. Wouldnt mind getting my hands on something fluffy down the line. From their current line-up I guess I want Amagiri Brilliant Park and Outbreak company printed, even though outbreak company is probabaly never gonna happen. We'll unless they make some big bucks and decide they dont mind printing some. Do these have an anime announced (yet)? I'm a little surprised, just because I didn't think they were series topping the sales lists whenever Sam leaks the top sellers. Though it's probably also true that the top sellers are already getting a print run, and these may be next in line down the list. If It's for My Daughter in particular seems like it could be off-putting to possible general readers because of ... spoilers, though I be overly biased by my own reaction there. If there's not already an anime announced, it's making me vaguely suspicious this is preempting an announcement. Or print could just be a reasonable strategy for second tier sellers (if I'm correct in calling them second tier). @hatguy12 I believe For My Daughter is the 4th best seller. I stand corrected (and surprised) then. I must not have been paying enough attention to Sam's leaks. Do we know if there are age ratings on these like most of the other publishers do with their LN releases? Print releases for two more books are up on Amazon. Nice. Does Last and First Idol have color inserts? I know Sam was saying Print on Demand could be something to look into for JK Haru since it didn't have inserts. Great, i really wasn't expecting a print release for Last and first idol, i'm preordering that one right away. @terrence Both JK Haru and Idol are basically regular novels, with no images save for the cover. Wondering if Sam will print Mari Okada's Truant. I'm surprised he chose to print Idol before it, honestly. Wow, I'm pleasantly surprised. I may get JK Haru again since it was amazing but it may be a little awkward having that title on my shelf lol. I didn't think they'd sell enough digitally to warrant print editions, especially Last and First Idol. Unless Sam figures it will reach the right audience easier that way? From what I've noticed of Amazon rankings, JK Haru actually sold decently well. I guess being an isekai, even with its... unique take on it, was enough to get it some good sales. As for Last and First Idol, yeah, I'd say it's more to give the book more recognition in science fiction circles. Well, given they're one-shots I'm not surprised they got print releases since even if they don't sell, the money lost on them would be minimal; if a print-on-demand model is possible given their lack of color pages, that just makes them even less of a risk. I believe Sam also said the sales threshold for one-shot e-books is much lower to justify a physical run. @guspaz agreed really hope JNC goes for that Doujin the author released a short while ago. The next step is figuring out how to handle the embarrassment when I'm talking with my local indie bookstore owner about special ordering it lol. Are you talking about ordering it for yourself or for the book store? If it is for yourself the you can order it online but if it is to stock it in the bookstore then I believe passion is a great asset.